What others should know: -This has been one of my best purchases from PA -Truly is quiet, based on another review here I bought this to use in my apartment and it's a great solution for my environment -Before I bought this pellet trap, I had been using stacked phonebooks behind target sheets... this was an el-cheapo solution that created tons of mess for me to deal with. I didn't realize how badly a couple dozen pellets would tear up them, ie. I had paper dust in my apartment for a while. With the ballistic putty backing, the A.G.E. trap has no such side effects. Things I liked: Good idea, but not strong enough. Two units arrived in the mail with the back panels detached from the weight of the ballistic putty moving during shipment. The back panel is thin and held on only with staples. A stronger design is needed to support the weight of the ballistic putty. What others should know: Customer service was excellent -- among the best I've experienced for an internet purchase. Things I liked: I would offer a metal plate to be placed in the box ahead of the duct seal. I put one in mine. Things I would have changed: In the photo I put aluminum strips around the exterior to save the box from errant pellets. I think this should be standard. What others should know: When this target is shot up you will have a good model for your own build. FOR THE PRICE, THEY SHOULD INCLUDE THE STEEL BACK PLATE, THAT THEY SELL FOR $9.99. AS CUSTOMERS, WE SHOULD NOT HAVE TO PAY EXTRA FOR YOUR SUGGESTION ON THE STEEL BACK PLATE. MYSELF HAVE SPENT CLOSE TO OVER $1.000.00 ON YOUR PRODUCTS. Things I liked: Excellent pellet trap for indoor shooting! Things I would have changed: The ballistic putty is not the full length of the trap. You need to put an inch of wood shim in there to level it off. But still well worth it! Yes there is not enough duct seal included. I bought 4 more pounds to fill in the gaps. I also added a metal plate behind the duct seal. Even a .177 will shoot through the duct seal and out the back. Things I liked: I really like this pellet trap. It is exceptionally quiet and the dimensions are just right. I have mine sitting on the top step of a step ladder leaning against the wall and it is the perfect size. Things I would have changed: I would make it a bit deeper as I get some paper chips coming out of the trap unless I continually use new cardbord backers. What others should know: This is a quality product. i highly recommend it. I am very happy with mine. Things I would have changed: For the Price; could be much better quality (fit and finish)! What others should know: Target paper size showed this manufacturer's GREED! Off-Size! Because of design, cannot a commonly sized 12 bullseye target (which is much cheaper and more readily available). Therefore must buy THEIR targets or forced to "cut down" size of common targets. "Cheap Shot", PUN INTENDED! Things I liked: Great trap. Works Well. Worth the money. Things I would have changed: I would strengthen it a little. Nail the backing on a little better, glue the seams, etc. Maybe change the size - see below. What others should know: WARNING: Only order replace target from Pyramid Air. 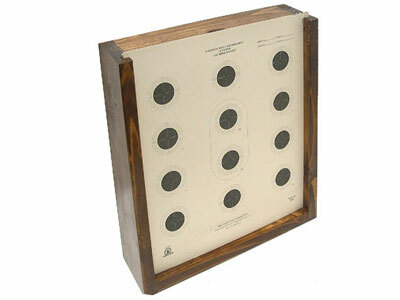 Regular AR-5/10 12 Bull targets are 10.5 x 12 inches. The 11.5 x 13.25 AR-5/10 12 Bull Targets are a special order for Pyramid Air Only. Things I liked: I liked this product, and use it pretty much every day. But it came slightly banged up (which didn't really bother me - its a pellet trap...) But the price...seems out of whack. If the box isn't terribly well crafted (looks just like a pine box), you're sort of overpaying - duct seal doesn't seem to be that expensive. Things I would have changed: Should come with a few replacement cardboard backers. Things I liked: Love that it's sized for the NRA targets. It's handsome, especially after I added am antique brass handle which makes it much less clumsy to carry. Things I would have changed: If you're shooting a high velocity air rifle the pellets will blow right through the "ballistic putty" and through the wooden box's back. I had to add a 1/8 inch piece of sheet steel ($15) to make it right. Ends up being rather expensive overall, but it suits my needs now. 5000 pellets later this pellet trap is holding up perfectly. I'm glad I added the sheet steel. In the end I realize I could have easily built this trap myself except for one thing. The "ballistic" putty is the same as a product called "duct seal" available at hardware stores. A 5 Lb. bag is $11+. Despite what the description here states, my trap weighs in at 25 Lbs. All of a sudden we're talking about $55 worth of putty plus tax plus a few dollars worth of lumber AND your time to construct. The price of this unit begins to make sense. Do realize you're probably going to want to add the sheet of steel in the back of the trap. Things I liked: Stops .25 cal from Hatsen sniper rifle no problem. If you miss the clay the rifle will blow right through the hard wood box. Works great. No ricochet problem. Stops everything. Things I would have changed: Nothing. You can cut up cardboard to back the targets and keep the clay in. I would add a handle because it is fairly heavy and hard to carry. What others should know: Works well to stop whatever you are shooting. I would back it up with a piece of plywood in case you miss the clay. Things I liked: Works as advertised, Quieter than other traps I have used, both boughten and home made. Sure stoppage of the pellets. Holds the targets well. Things I would have changed: Atop handle would be a nice addition. What others should know: Expensive, but a very good product. Things I would have changed: The price, most expensive wooden box I have ever bought. Things I liked: This trap is really great. I think the problems people are having with pellets getting through the putty material can all be avoided. First, take the putty out of the plastic it comes in. Second, pack it in to the base so it's one solid piece with even coverage. Regardless what the description says the amount of putty that comes with it is the right amount. Works great and really is very quiet. Things I would have changed: I added a handle at the top like a few others have done. This really makes it much easier to cary. It is heavy so its kind of awkward to carry without a handle, especially with one hand. It is a little pricey but the putty is not cheap and it is a great product even for the price. What others should know: Make sure to install the putty properly and it will work great. I bought a sheet of foam board for a few bucks and cut out openings for the different size targets I'm using. Then I just clip the targets to the board and slide them in. I don't use the cardboard backing at all. Things I liked: Quiet! Great for indoors or in the suburbs. Well built. Nicely finished wood. What others should know: Th first time I used it, I had a tight 5 shot group that blew a hole through the back about the size of a quarter...using nothing more than 12FPE. Things I liked: It is quiet and mostly well-made. Most of the pellets embed nicely in the duct seal material ("ballistic putty") which sits behind a cardboard target backing. Things I would have changed: The back of the trap is made of very thin wood which fractures easily as the pellets fly through the seams in the three bags of duct seal. The biggest annoyance is that the 10M 12 Bull targets I previously purchased are too small for a secure fit. I have to use push-pins to secure the target. As others have said, there are only 12.5lbs of duct seal rather than 15lbs. What others should know: The "target backer" is actually just a piece of cardboard. I now make sure I cut replacement cardboard backers whenever I receive a large shipping box. The duct seal material is actually 2 1/2 bags of 5lbs each. Unfortunately, pellets can fly between the edges of the bags and into the trap backing. I've tried reforming the bags but haven't solved this problem. Make sure you purchase the 10M targets linked on the trap's web page so you get the right size. Things I liked: It is an excellent product. Truly quiet, contains lead dust. Works just like it is supposed to. Things I would have changed: I afixed a handle to the top of mine, a simple modification I highly recommend as it makes it so much easier to carry. What others should know: 12.5 vs. 15 pounds of duct seal? The 12.5 is the correct amount to fill the trap.